dBs Music Plymouth graduate Kris Ryeland (aka Ryeland/Kidd Kaos) has enjoyed an amazing career as a DJ, music producer, brand and label owner; from being signed to one of the UK’s biggest dance music agencies (MN2S) and collaborating with different DJ Mag Top 100 acts, Kris has travelled the world over showcasing his work. We caught up to talk career highlights and life as a DJ/Producer, working with UK Top 40 artists, his time studying at dBs Music and how it helped shape his career so far. Tell us about your time at dBs Music, what were your highlights while studying with us? I studied at dBs Music between 2006- 2009 graduating with a BA (Hons) degree in Sound & Music Production. It was great to be able to work in professional studios with the latest technology and software. We also had access to hardware synthesisers and good quality recording equipment. dBs Music helped me build my knowledge of music production, mixing and mastering as well as develop an understanding of the music industry. Many of the tutors had years of experience in the industry and it was great having access to their pool of knowledge. How did your time at dBs Music help you progress in your career? During one of my projects, I decided to produce an album, develop a brand identity and market myself and the music that I had made. This helped me gain a vision of what I wanted to achieve in my music career and set me on the right path. One of my tutors at the time Andy, was a great mentor. He also had his own dance music label and gave me my first recording contract to produce a remix for his song. Working with Andy inspired me to set up my own label which had many releases. The tracks I released at the time was supported by a lot of big name DJs which led onto me winning the award of a best new producer and gaining a BBC Radio 1 Essential Mix. What have you been up to since graduating from dBs Music? I’ve spent a lot of time travelling and performing all over the world and have been lucky enough to play in places like Australia, Canada, Indonesia, Japan, Ibiza and across Europe. I promote music events and run two record labels K405 Records & Ryde Music . I also spent time as an in-house engineer, writing music for music production house Zenomainia. During my time there I co-wrote tracks with Nadine Coyle (Girls Aloud), Molly King (The Saturdays) and many more; this lead to releases on major labels such as Virgin Records and Island Records (UK). Tell us about your favourite career moments so far. 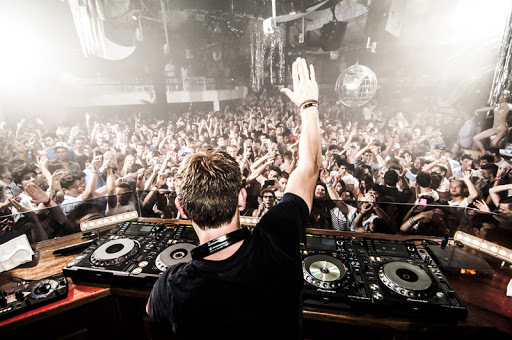 The first time I played at Pacha in Ibiza was an incredible experience. The brand has always been close to my heart and it was an honour to perform alongside household names like Martin Solveig, Laidback Luke and Sidney Sampson. At the time being the youngest artist to be awarded a BBC Radio 1 Essential mix was pretty awesome too. Playing Boardmasters Festival in Newquay was another good one because it has a really special atmosphere. It was great to do a festival like that so close to home. Finally working with Akai & Alesis on their MPC Range as an artist ambassador was a standout moment having grown up using their equipment. Finally, any advice for people thinking about a course at dBs Music? What I gained from dBs Music really helped me with my career and grow into the artist I am today. Not only did I gain a vast amount of knowledge from the course I was able to get important feedback from the tutors on my own work which helped me improve on many levels. Getting the right feedback from the right people is crucial if you want to grow as a musician.